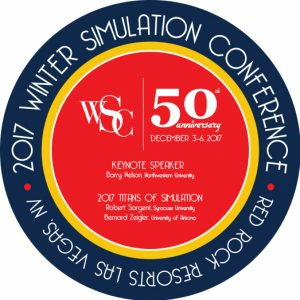 WSC Turns 50: Simulation Everywhere! From experimentation to theory; standards and advanced methodologies, modeling and simulation is continually pushing the envelope of the available technologies, as many sectors have growing needs to process, visualize, make readable, understand, and deploy complex models that use immense amounts of data. These players need to transform data into hypothesis building and critical decision-making, and to change their models in response to new hypotheses, usually involving multiple highly specialized experts working together in geographically distant areas. After 50 years, we are now beyond Modeling and Simulation using Grid and Cloud computing, Web-based and distributed simulation and other recent technologies. We need to deal with computing power and storage in heterogeneous environments, resources virtualization; services consumed on demand (with minimal limitation for resource location), power issues, massive datasets. We face new challenges as we have ubiquitous processors that can process applications on demand. WSC 2017 focus is on addressing how to achieve the goal of having Simulation Everywhere! WSC 2017 is sponsored by: ACM/SIGSIM, IISE (Institute of Industrial and Systems Engineers), INFORMS-SIM and SCS (Society for Modeling and Simulation International), with Technical Co-Sponsorship from ASA (American Statistical Association), ASIM (Arbeitsgemeinschaft Simulation), IEEE/SMC (Systems, Man and Cybernetics) and NIST (National Institute of Standards and Technology).